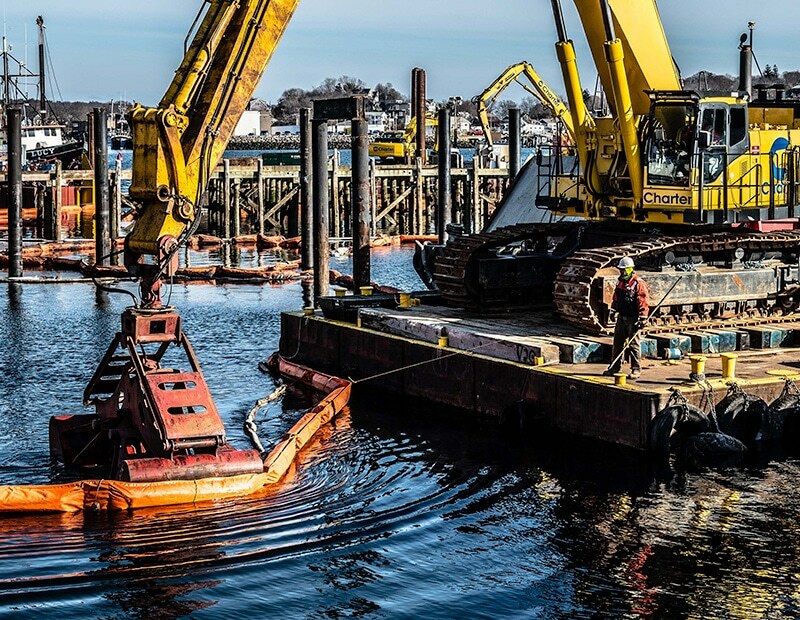 Charter was the prime contractor for this multi-million dollar, multi-year, highly complex project for National Grid that was executed in an active, congested, industrial and commercial waterfront in Gloucester, MA. 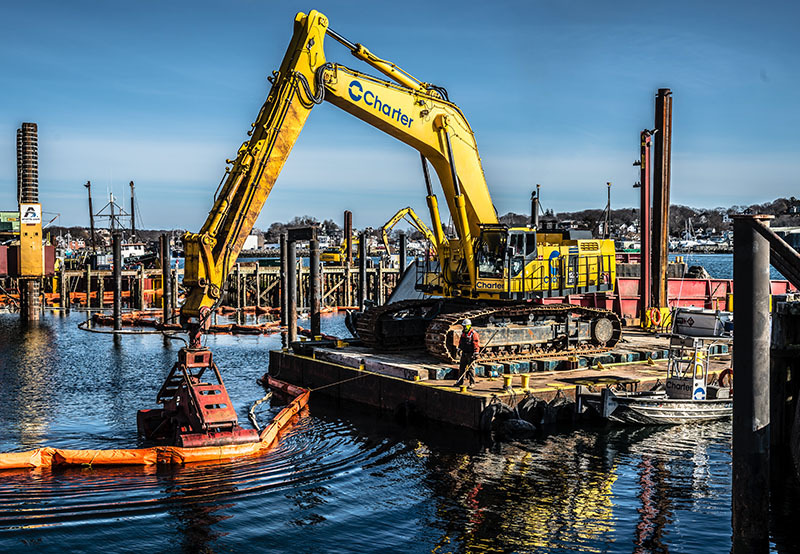 The work was performed entirely along the historic waterfront at Harbor Loop and encompassed an upland and nearshore area, and an offshore area extending across approximately 12 acres. In the late 1850’s Gloucester Gas Light Company (GGLC) had operated a Manufactured Gas Plant (MGP) along the Gloucester waterfront for nearly 100 years. 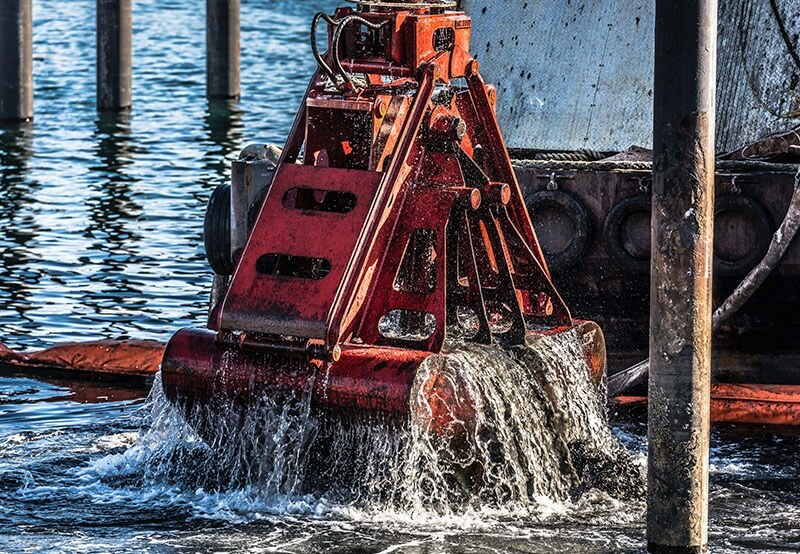 The operations left behind waste products such as tars, sludges, and oils that contaminated the waterfront.  The Gloucester project is one of the most complex and sequenced projects Charter has undertaken. 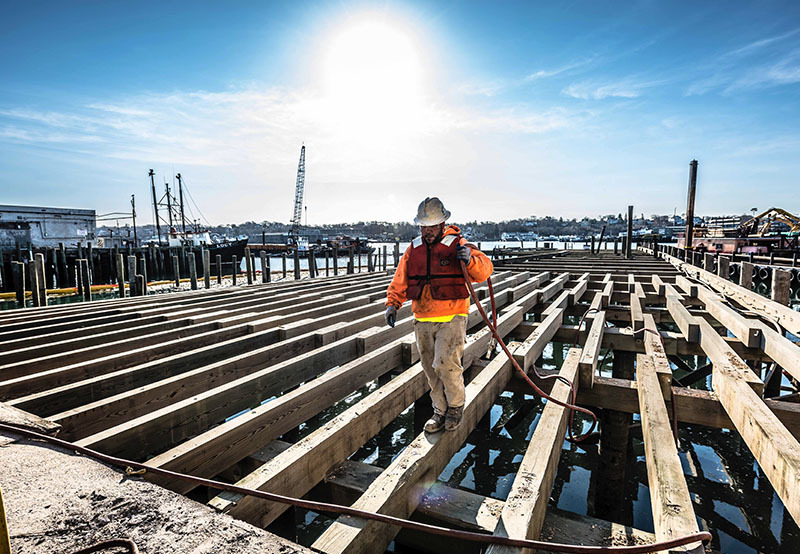 The project site is a compact area along Gloucester’s active Inner Harbor and sits on four different properties owned by National Grid, the US Coast Guard, City of Gloucester, and Maritime Gloucester Museum. 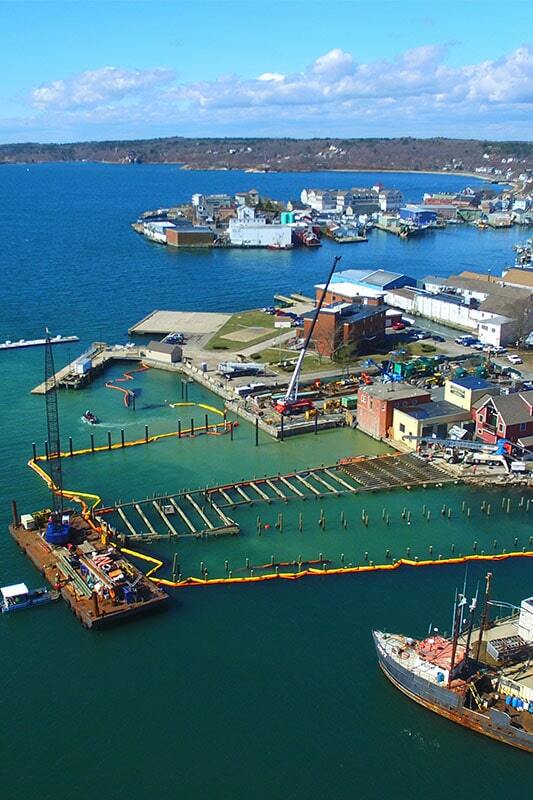 Charter began work on the project in 2015 and over the course of multiple construction seasons completed dredging, capping, dewatering, transportation, and reconstruction of the historic waterfront infrastructure. Sequencing was critical on this project due to the project’s location in an active and historic waterfront. 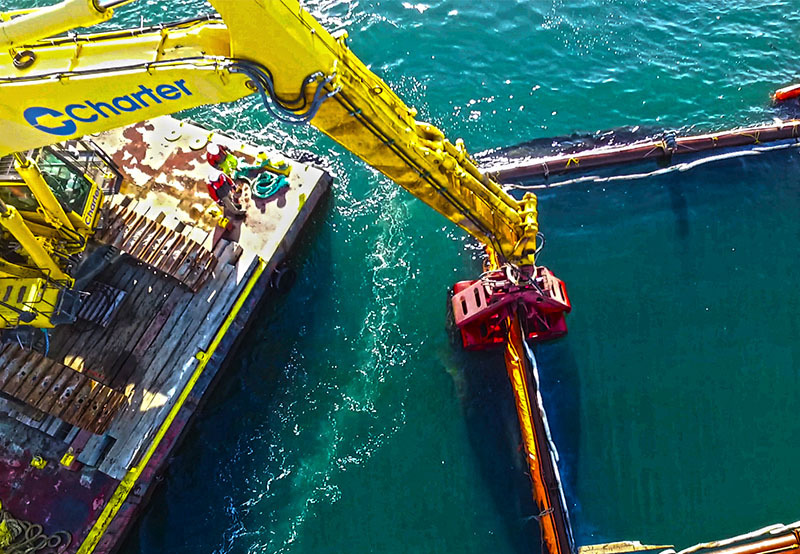 Charter successfully met the needs of the active port by sequencing construction activities around an area with multiple, critical stakeholders. 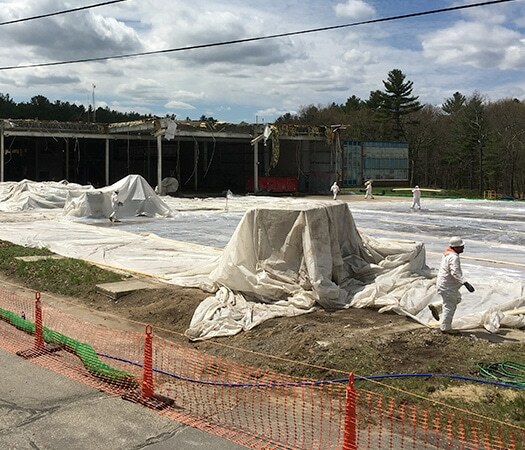 All area businesses maintained normal operations and visitors remained unaffected by the complex and intricate construction activities performed within a 78,970 SF waterfront area. With an active U.S. Coast Guard station on the site, Charter maintained constant communication with the U.S. Coast Guard to ensure construction activities did not interfere with their operations. 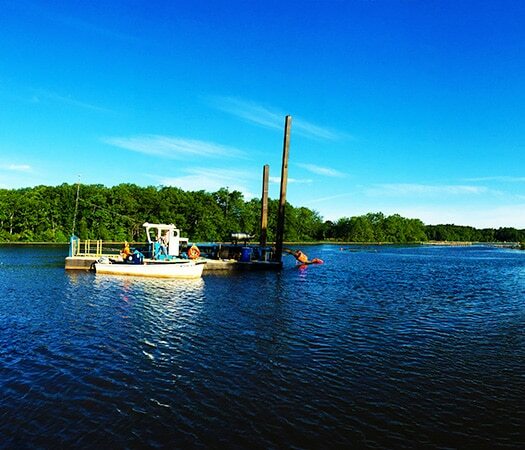 Charter worked with the Coast Guard to relocate their rescue boats quickly to a designated temporary docking area that was easily accessible, ensuring they never lost access to their boats. Another component of the constricted space on site was coordinating daily work activities. With multiple subcontractors interacting with each other daily, Charter personnel utilized scale models to plan who would be working where. Charter personnel also used CAD programs to check clearances and develop work plans to ensure sequencing was achievable. 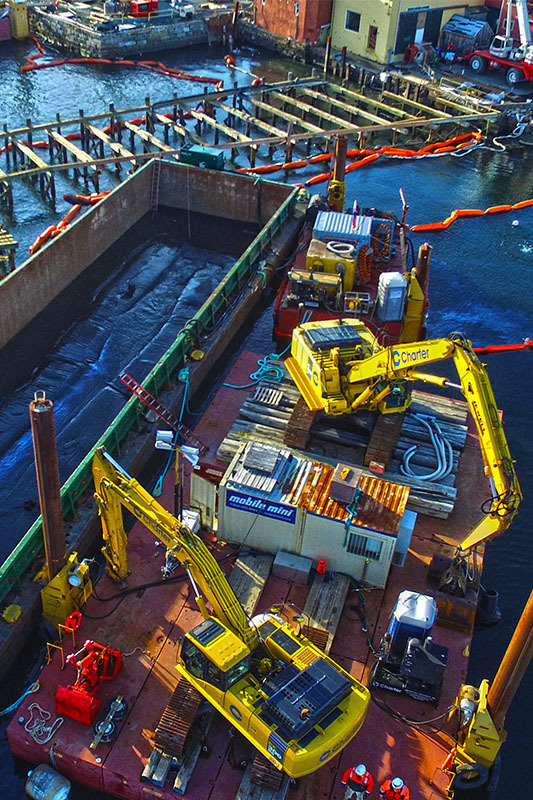 Over the course of two construction seasons, this large-scale project brought with it various challenges, from time constraints to difficulties caused by tides, that crews took an innovative approach to solving. 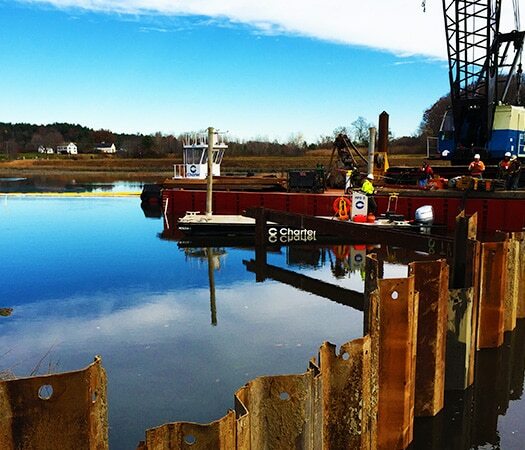 To better meet the needs of the client and the community, Charter proposed an alternative disposal method whereby approximately 1,800 truckloads of contaminated material were replaced with thirteen barge loads that were shipped by tug boat to New Jersey, eliminating the need to trans-load onto land, dewater, stockpile, and process the MGP impacted sediments in downtown Gloucester. This alternative disposal method also eliminated the volume of trucking through a highly trafficked congested area that would have imposed subsequent disruptions to nearby businesses, residents, and tourists. Since the site is part of an active harbor there were various time constraints to ensure the area remained open for business and to the public. Crews worked 24hrs per day, working double shifts, in 10 foot tides to excavate sediments and debris to a depth of 35 feet. Intricate sequencing of project activities accommodated regulatory permits, winter conditions, Coast Guard vessels, commercial fishing fleets, whale watch boats, sightseeing cruises, and the public. Gloucester Harbor has a rich history dating back to the mid-1600’s when its first permanent residences settled in the area.  Up through the late 1800’s, Gloucester Inner Harbor was developed into a vibrant neighborhood with a bustling fishing industry and various store fronts, especially in the area known as Duncan’s Point, the site of the Gloucester project. While innovations to fishing techniques and related technologies led to a decline in Gloucester’s fishing industry, commercial fishing continues to this day to be a part of the city’s makeup and many historical pieces of its marine history remain including the granite seawalls which were demolished and reconstructed and the Burnham Marine Railway. 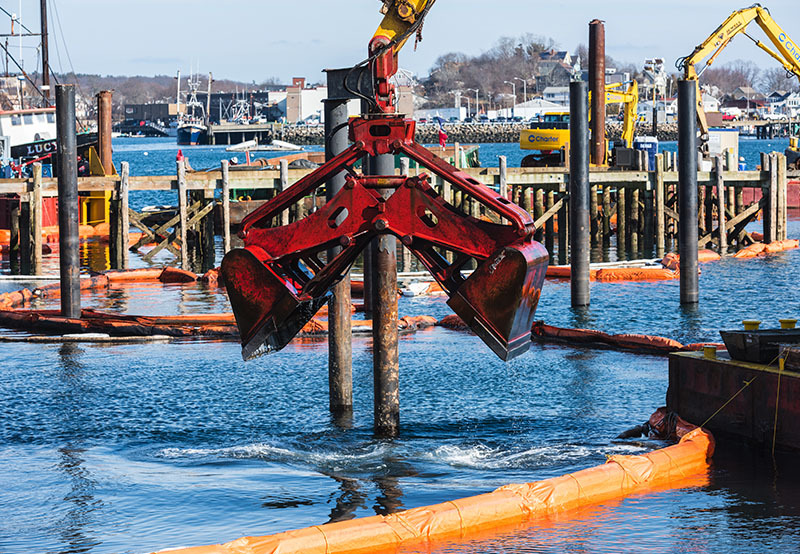 Work at these structures required specialized permits issued by the Massachusetts Historical Commission, Massachusetts Board of Underwater Archeological Resources, and the United States Army Corps of Engineers. In addition, a histrionic representative from the Public Archaeology Laboratory (PAL) was on-site to observe the reconstruction and preservation of the seawall, as well as the diver-assisted suction dredging of 30,0532 CY of sediments around the historic marine railways. Favorite part of the job: "Gloucester stands out as one of my favorite projects.  I worked with a lot of different and wonderful people that helped execute the job"
In 2001, Steve joined Charter as a welder and has since become an operator for the company. On top of his diverse skill set and years of experience, he brings a positive attitude to every job he is a part of. The Phase IV Remedy Implementation performed in Gloucester, MA has been recognized for its commitment to safety with an ENR Safety Merit Award!